Homemade Sausage Rolls are a Christmas tradition in our family. It’s hard to go past a simple appetiser like these that also tastes so good. Christmas is my absolute favourite time of year. I’m so excited to share my first Christmas recipe with you and especially to be sharing this one which is really close to my heart. I’ve been wanting to post this recipe for a very long time. It is hugely sentimental to me because it’s my mums and it’s a big tradition of ours at Christmas time. Every year at Christmas time my Mum makes her homemade sausage rolls. Every Christmas. With. Out. Fail! This recipe would come out for other celebrations here and there but rarely. These little puffed up golden delights are mostly saved for Christmas time. I remember getting excited when I’d see the ingredients in the fridge because then I knew it was nearly time. From there, I would bug mum about when she was going to make them. I would help too and it was this simple little tradition of helping Mum roll sausage rolls, with DJ Dads Boney M Christmas album on in the background that is one of my most cherished Christmas memories. 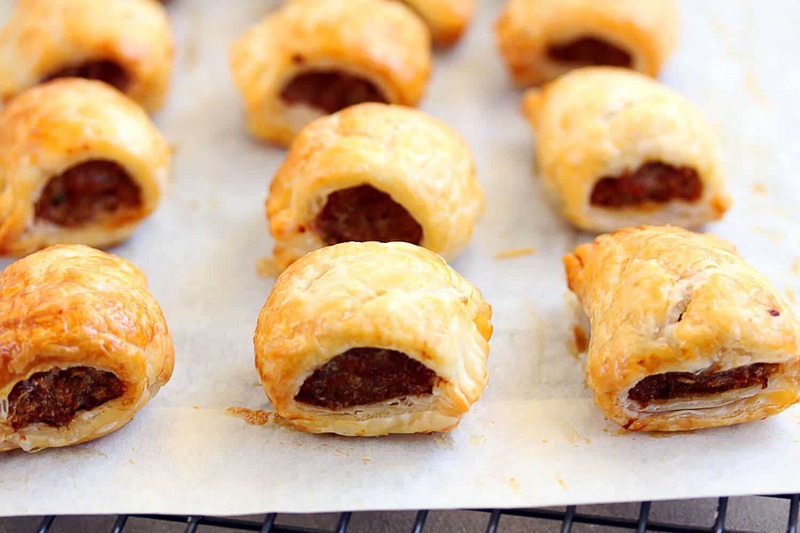 These flavourful yet simple sausage rolls are requested at every family get together. Since moving out of home, many moons ago, I get twice as many. I now make a batch myself and then hoe into the real deal at Mum and Dads place too. These sausage rolls are often a request at family get-togethers, as well. You’ll see why. They are so full of flavour but so simple and only have 5 ingredients. Well, actually there’s 7 if you include the salt and dredging flour but one ingredient is optional anyway. You’ll need shop bought puff pastry (I like Borgs best) half an onion, standard sausages and fresh thyme. Throw in a little salt, egg wash at the end then chop and bake. Tadaa! Christmassy, sausage rolly goodness. These sausage rolls are great hot or cold, although hot is best in my opinion. They stay crispy the next day too, even out of the fridge. And they are such a great option if you are taking a plate of goodies when visiting friends or family. We grew up with them on their own but you can add some sauce as I have here and as my hubby enjoys them. These best homemade sausage rolls are a Christmas family tradition for us. Preheat oven to 395F / 200C / 180C fan. Line a cookie tray with baking paper. Use a sharp knife to split the skins of the sausages and then just peel the skins away and discard. Mix the sausage meat, onion (must be chopped very fine), thyme and salt in a bowl. Now set up your space. Have a large chopping board, a fork, a sharp knife, a small bowl of water and your flour close by. Lay one sheet of puff pastry onto your chopping board. Now you can eyeball it if you like but you basically need about 75g of the mixture, roll it lightly in the flour so that your hands don’t get sticky, then roll it out into an even log on top of the puff pastry. Lay it just a couple of centimetres from the edge of the pastry, then use your finger to run some water around the edge of pastry closest to you and along the sides. Fold the pastry away from you, over the top of the meat and press the join down firmly on the other side of the sausage meat. Make sure it’s tight, you don’t want air trapped inside. Use the knife to cut away the other half of the sheet, then press down all along the joins with the fork. Trim away a little of the join if it’s too wide. Cut each log into 5 pieces, then jab with the knife 2 little air holes in the top of each one to allow steam to escape. Sit them onto the baking tray then repeat with the rest of the pastry and meat mix. You can freeze half at this point by laying them on a baking tray in the freezer, then once frozen, transfer them all to a plastic bag or container. Or you can bake them all. Once all the sausage rolls are sitting on the baking trays, lightly brush them with the egg wash, then bake for around 20 minutes until light golden and crispy. Give them a couple of minutes to cool down before taking a bite. Nutella Hand Pies in the best sweet, flaky pastry!